Mugs with a difference....just add any hot drink and watch how the picture changes. Six to choose from. Vincent Van Gogh: A few years ago, cutting off one's ear was considered to be a meaningful present (or so thought Mr van Gogh). Watch the mug as his ear disappears when it gets warm. Cheshire Cat: What an odd mug, add a hot drink and the cat disappears but its grin stays. Henry VIII: If only disposing of his wives was this easy, add tea or coffee and watch how his wives are erased. 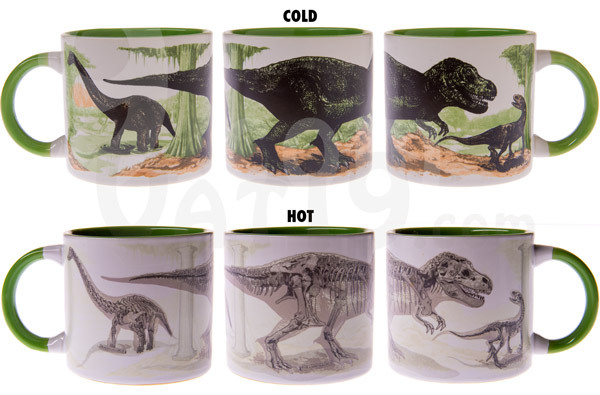 Disappearing Dinosaurs: Watch the dinosaurs turn into fossils as you add hot water. Adam and Eve Mug: Add hot water and they suddenly don't seem quite so innocent.